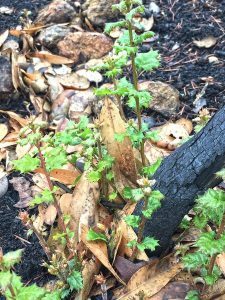 Fire Ecology for Non-Scientists: I Will Survive! This is the second article in our Fire Ecology for Non-Scientists series. Click here to read the first on The Fire Triangle & Fire Behavior. 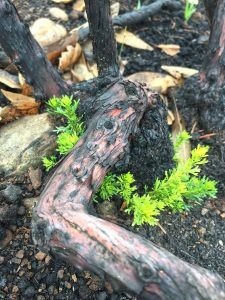 Chamise resprouts in a Pepperwood chaparral grove. Though many of us humans were surprised by the fires last fall, if the plants that live at Pepperwood could talk I bet they would say they were not very surprised. In fact, I bet they would say they were prepared. Our local vegetation has evolved many clever ways to regenerate after fire. In fires of low to medium severity, many of our plant friends have a fighting chance to not only stay alive, but also thrive. 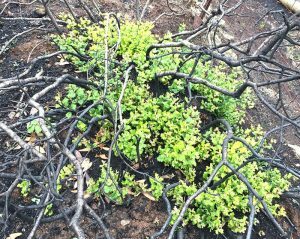 Read on to learn what amazing mechanisms these verdant survivors exhibit to reside in our fire-adapted ecosystem. As you may recall from elementary school, plants produce their own food through photosynthesis. Unlike us, plants cannot go get food. They produce green leaves, which contain chlorophyll, and through photosynthesis—which requires water and sunlight—make sugar. If a tree loses its leaves, it cannot feed itself. Many plants in Pepperwood’s chaparral areas are resprouting! Sprouting is one way plants can regenerate after a fire and quickly begin feeding themselves. At Pepperwood, we are already seeing many trees and shrubs sending up sprouts and growing new leaves. Just two weeks after the fires, for example, we observed coast live oak (Quercus agrifolia) leafing out. Arm-like shoots reaching for the sun can arise from dormant buds above the soil surface, or even below the leaf litter. Many of our chaparral plants are already sending up such growth. The charming toyon shrub (Heteromeles arbutifolia) sends up stump sprouts around the base of the plant, as do manzanita (Arctostaphylos spp. ), leather oak (Quercus durata), and coyote brush (Baccharis pilularis). Blue oak (Quercus douglasii), black oak (Q. kellogii) and Oregon white oak (Q. garryana), all found at Pepperwood, can also regenerate with stump sprouts and growth from root crowns. The root crown is the point at which the stem and the roots meet. Tanoaks (Notholithocarpus densiflorus), though not actually oaks, can regenerate in the same manner. Coastal redwoods (Sequoia sempervirens) can regenerate from their root crown too. You may have observed this if you have ever come upon a redwood tree “fairy ring.” Each of those trees in the circle sprouted from the same root crown. Amazingly, coastal redwoods also have dormant buds all along their trunks that spring to life from under the thick bark after a fire, carpeting the entire burnt trunk in a brilliant lime green. A coast live oak resprouting from its canopy. Photo by Gary Morgret. Because of their underground storage organs, geophytes are well adapted to withstand the effects of fire. Growing deep in soil, the bulbs, corms, and rhizomes are protected and insulated from the heat. Fire benefits geophytes in a number of ways, and are actually dependent on its regular occurrence. As if hanging out in an underground bunker during a disaster, geophytes can emerge and take advantage of the post-fire ecosystem after the smoke has cleared. At Pepperwood we are already seeing large bursts of early germinating soap lily and death camas (Toxicoscordian fremontii) taking advantage of the cleared understory after the fire, and promising brilliant white blooms in spring. A leather oak resprouting at its base. Seeds are another way shrubs and trees renew their plant community after a fire. Some seeds have adapted to withstand fire, while others even require fire to germinate, waiting in the soil for years at a time. Pepperwood’s chaparral shrub chamise (Adenostoma fasciculatum) is an example of a plant whose seeds need heat to germinate. Sticky monkeyflower (Mimulus aurantiacus) seeds can also be coaxed to germinate by heat or smoke. A manzanita (Arctostaphylos spp.) seed’s hard seed coat requires a disturbance such as fire to break the seal and begin the germination process. Several flowers we hope to see this spring at Pepperwood for the first time in many years require fire. I’ll be writing about these in a future blog. Acorns in the canopy of oaks can survive low severity fires, but once they are charred, they cannot sprout. However, the acorns that remain viable and un-burnt may have a better chance of survival as fire can reduce leaf litter, which can choke out baby oak seedlings by preventing acorns from reaching the soil surface as they germinate. Over the next few months and coming years, Pepperwood’s forest and chaparral ecosystems will be reviving themselves in a number of ways. If you want to see it for yourself join us for an upcoming public hike!